Welcome to Found Off The Street, our look at cars found on the cape that rust liked so much it decided to summer there; Cape Cod, MA. Today we have a 1964 Chevrolet Corvair. Last week's 1946 Ford Panel Truck and this week's 1964 Chevrolet Corvair convertible have little in common beyond the fact both were photographed during winter's last stand on the cape that rust remembered. This Corvair is a little rough and ratty but in sharp contrast to the Panel Truck this Corvair's primary purpose is providing the owner driving enjoyment. We've already seen a FOTS early Corvair but unlike its hard top predecessor, this Corvair is fully functional and roadworthy. As you can see from these pictures, this compact convertible isn't afraid of a little snow. The fifth model year was a transitional period for the Corvair. 1964 was the last year of the first generation Corvairs and several improvements were made ahead of the complete redesign in 1965. The Corvair's base engine size was bumped from 145ci to 164ci which increased the flat six's horsepower from 80 to 95. Several steps were made to improve the car's swing axle rear suspension, including making the optional heavy duty suspension standard on all Corvair models. While these safety and engineering advancements were a big step forward for the model there were no exterior styling cues to indicate any major difference from the previous year's Corvair. 1964 was really the last year all was well in the Corvair universe, as the car would ultimately be doomed with the release of Ralph Nader's book "Unsafe at Any Speed" in November 1965. Although the book in its entirety was a general condemnation of the American auto industry, one chapter focused on the "unsafe suspension design" of the rear engine Corvair. In 1966 Chevrolet only sold half the amount of Corvairs they had the year before, largely because of Nader's book and the model's sales figures never really recovered. Many years later, Corvairs can still be found relatively cheap making them an ideal entry level vintage car that can be enjoyed without the hassle, concern and investment of more expensive models. The current owner of this '64 convertible had all of these factors in mind when he purchased this Corvair. Found in central Massachusetts a few years ago and relocated to the cape that rust forgot, this Corvair has proved to be the ideal budget cruiser. Last painted in a one car garage by the car's previous owner, underneath the snow this Corvair's amateur paint job is showing expected signs of age. 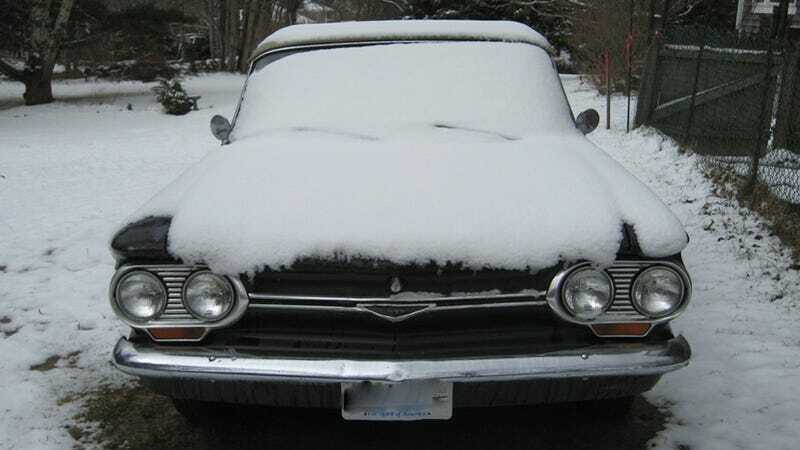 Like many of our FOTS cars, this Corvair spends its winters outdoors, although this one is partially sheltered. Predictably several Massachusetts winters haven't done this old car any favors body wise. Although it is far from perfect cosmetically the owner is quick to point out that the car runs and drives beautifully, which is arguably more impressive for a car of this age than a shiny paint job. Sitting with a layer of snow on it behind a garage which contains a pair of pampered collector cars, it is hard not to appreciate a car like this Corvair. It certainly isn't the prettiest vehicle ever made, but an old car that can be driven and exposed to the elements without a huge level of concern has its own kind of beauty. While many other old cars are sitting under a cover in the garage or on a show field, this old Corvair is seeing regular street use whenever the roads are salt free. Perhaps more than any other vehicle we've seen so far, this old Corvair is just as likely to be found on the street where it belongs as sitting off of the street.